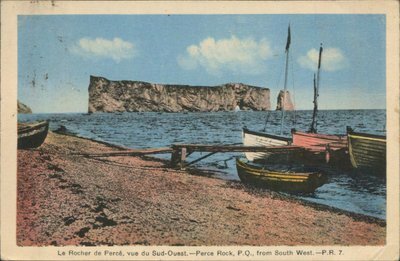 Postcard with the view of Le Rocher de Percé. The message on the back is written by Jean Annette Hall. Date on stamp Aug. 20. Le Rocher de Percé, vue du Sud-Ouest. - Perce Rock, P.Q., from South West. - P.R. 7. Published by H.V. Henderson, West Bathurst, N.B. Scenic Postals, Views Albums, Enlargements, Amateur Finishing Hand Colored Views and Hand Craft Souvenirs for Tourists. We just left Gaspé yesterday and are coming up the Matapedia valley, the roads are [...]? we may be back at the first of the week.